An egg may be boiled using a variety of different methods, but the best way is always to soak it in boiling water. If your eggs aren't boiling as they should, it could be because you're directly boiling them or you aren't cooking them long enough. Once you've learned to make the perfect boiled eggs, try using them in salads or fried rice, or making them into delicious deviled eggs. The saucepan method of boiling eggs is the fastest, and it yields the best tasting result. Place eggs in a single layer in the bottom of a heavy saucepan. Cover them with cold to lukewarm water to about an inch over the top of the eggs. Turn the heat to medium-high and bring the water to a rolling boil. Once the boil is achieved, turn off the heat and cover the pan. Turning off the heat will stop the boiling, which is essential for perfectly boiled eggs. Directly boiling the eggs can result in a green yolk with a sulphur taste and a tough, rubbery texture. Allow the eggs to sit for 10 to 15 minutes, depending on how hard you want the yoke to be. Use a kitchen timer to ensure you don't leave them sitting too long. Drain the water from the eggs, and then run them under cold water or plunge them in a bowl of cold water to cool. This process will also make them easier to peel and reduce cracked shells. 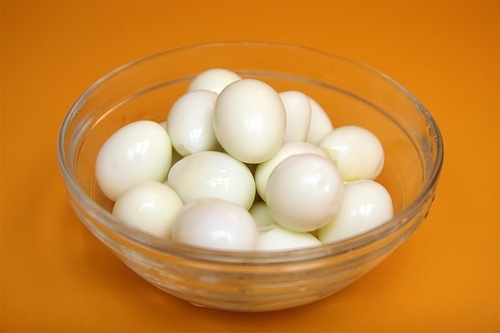 Store the boiled eggs in the refrigerator in an air tight container until ready to use, or peel immediately. Alton Brown, a popular American food personality and author of the book Gear for Your Kitchen, recommends using an electric kettle to boil eggs. This method is similar to the saucepan method, except you'll have no need to regulate the heat yourself. Place the eggs in a single layer in the bottom of an large electric kettle. Cover with water to about an inch over the top of the eggs. Turn on the kettle and bring the water to a boil--the kettle will shut itself off automatically when the water is boiled. Once the kettle is off, simply set your kitchen timer for 10 to 15 minutes and allow the eggs to sit. Drain the water, and then submerge the eggs in cold water or run them under the tap to cool. Before placing the eggs in the pan, take them out of the refrigerator and let them reach room temperature, if possible. This will reduce the time it takes them to cook through. However, refrigerated eggs may be used successfully with either of these methods. Add a few additional minutes to the resting time, if necessary. While 10 minutes is all it takes to boil average size eggs, eight minutes might be enough for very small eggs, and you may need up to 15 minutes for very large eggs. Use less time for softer boiled eggs and more time for harder boiled eggs, depending on your personal preference. What Kind of Pan to Boil Eggs?